Slice mozzarella into 12 pieces divide among six plates. 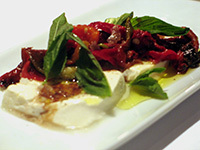 Top mozzarella with roasted peppers, and season to taste with salt and pepper. Garnish with basil leaves. Drizzle olive oil and aged balsamic over the top.